American Flag Frame Tents By Worldwide Tents!! This Hi-Peak Frame Tent is Top Of The Line Commercial Grade! This beautiful American Flag Frame Tent is the ultimate in a patriotic themed tent! The American Flag Frame Tent top is top of the line 16 oz. block-out vinyl! The 16 oz. “block-out” vinyl does not allow light to come through. This great feature makes the tent cooler underneath in the daytime. The Worldwide Tents superior quality double tube frame is made out of the best marine grade anodized finish super heavy duty aluminum. This great American Flag Frame Tent really stands out, is beautiful, and makes a wonderful patriotic statement! 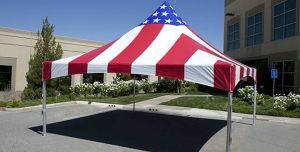 This great patriotic American Flag Frame Tents tent is a real eye catcher and would be excellent for Auto Sales, Fireworks Sales, Furniture Sales, Party Tent, Concession Stand, Events…you name it!! The frame tents come with the superior quality 16 oz. block-out vinyl patriotic American Flag Top, anodized finish aluminum frame, and all hardware you will need to setup this incredible Hi-Peak American flag Frame Tent. It does not come with sidewalls but sidewalls can be attached easily and are certainly available from us! We offer cathedral window sidewalls as well as solid with no windows. Contact us immediately if you want to order one for July 4th activities! Worldwide Tents offers the very best deals in high quality super heavy duty Frame Tents, Pole Tents, Party tents, Revival Tents, Event Tents, Church Tents, Sales Tents, Hi-Peak Frame Tents, Concession Stands!! We have received great reviews on these fantastic super heavy duty top of the line American Flag Frame Tents. If you want one, or need one contact us with all of your questions. Please fill out the contact form or email us today button, or call us at 407-579-7187 for more details, pricing, shipping quote, etc.